What are the best tactical role-playing games for mobile devices? I see that question a lot and, inevitably, somebody mentions Warhammer Quest ($2.99) by Rodeo Games, and rightfully so. Warhammer Quest is without question one of the best turn-based combat games out there and one in which I’ve invested a huge number of hours in the four-plus years since its release. Rodeo Games is no more, unfortunately, but that didn’t stop a sequel from making its way to the App Store. Warhammer Quest 2: The End Times ($0.99) was just released by Perchang, but can it clear the high bar set by its predecessor? Perchang is home to a lot of the talent from Rodeo Games so the band is largely back together and it shows in The End Times. The game looks and feels similar, as well it should, there’s no need to reinvent the wheel when the one you had is quite good at, you know, rolling. Things are dire in Middenland and a new threat has emerged. A king with three eyes has amassed an army of evil doers to assault the world and all its people and bring about an apocalypse. If you can’t trust kings with three eyes who can you trust these days? Unwilling to go quietly to their doom, the powerful across the land with a stake in the status quo set aside their differences and gather to take on the three-eyed king and save the world. Two such paragons are Captain Marcus Hammerfall of the Empire and a dark-elf sorceress named Meharva Darkshade. The pair strike an uneasy and assumedly temporary alliance to seek out the Mace of Helsturm, a powerful artifact that could swing the battle against the King and his army of chaos. Together, they enter the ruins beneath Altdorf on their quest, and you control them. You start out The End Times with Marcus and Meharva but pick up other companions as you progress. Much like the original, the game plays out as a series of regional quests in Middenland. Each quest in the main storyline takes you to a different city or town and into a dungeon delve. Prior to entering you pick and equip your party and send them forth to defeat the minions of the three-eyed king and any other dungeon dwellers who dare block your path. As you complete quests you gain experience for the heroes that participate, as well as loot and gold. Each town and city provides opportunity to level up your team at the training grounds, buy and sell loot at the market, and recruit new companions at the tavern. 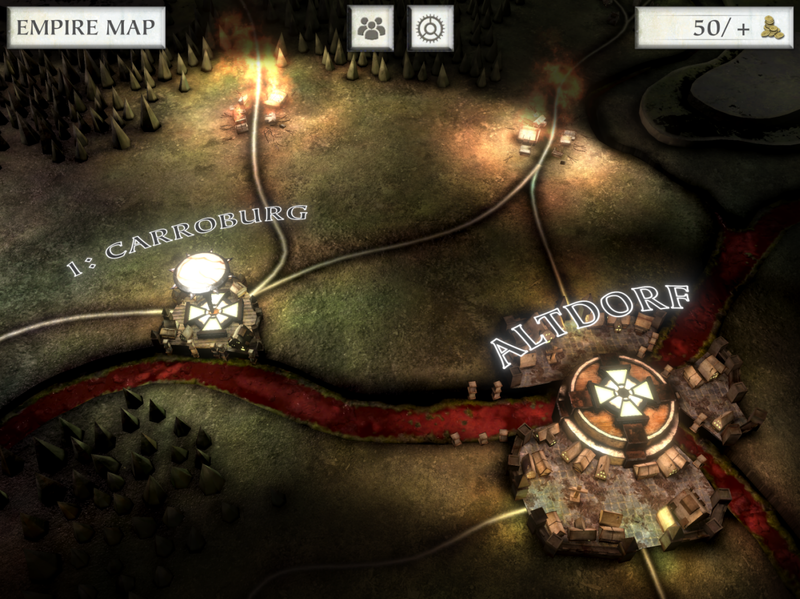 The End Times follows the main storyline with each delve taking you closer to your overall goal. There are also side quests that can be used to help level your characters and get more loot as well as random events that pop up during travel that add some nice immersion to a game that is, for the most part, more hack and slash than role-playing. 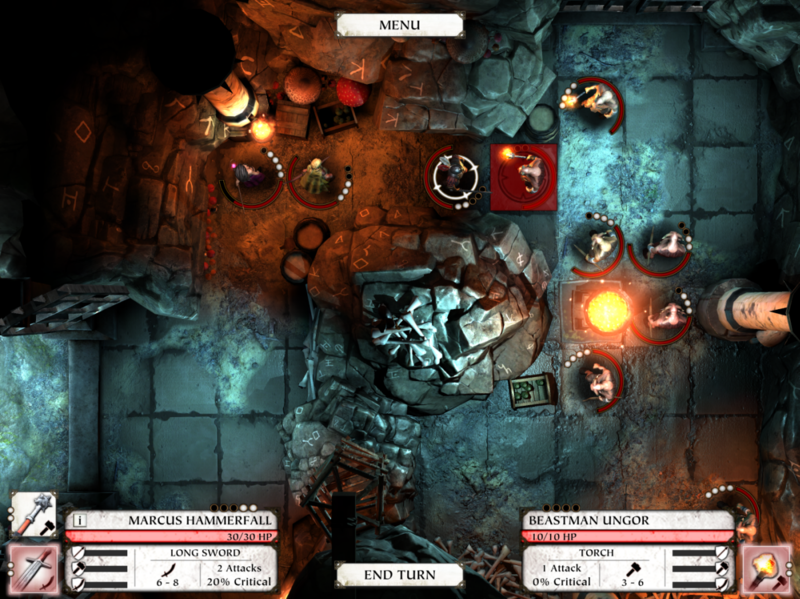 The combat encounters play out the same as the original and will feel familiar to any fan of turn-based role-playing games. Each member of your party has a pool of action points that can be used to either move or attack. This lets you cruise a great distance across the map, take a more modest move action and attack enemies, or take multiple attacks. There are a number of different weapons and some characters can switch between melee and ranged options. The touch controls are well-implemented and you can play through turns very quickly if desired or take your time to ponder your best move. As you level each character gains access to more options, opening up the strategic variety you have at your disposal to take down any particular fight. Video-game graphics have come a long way since 2013 and The End Times is certainly modernized from the original. First, it is fully 3D and looks great. You can zoom in and out and turn things every which way to enjoy the camera angle of your choice. The city maps are quite attractive and highlight the height of castles and towers and nicely reminiscent of the Game of Thrones opening sequence. I also like the forests and other terrain features present in the world travel maps. Let’s talk payment model. Warhammer Quest 2: The End Times is a premium game where the initial price gets you the Middenland campaign with no restrictions. There is an expansion available as well. For $5 you can buy the Reikland region which adds a ten-part regional quest, new settlements, a new enemy—the dastardly rat people known as Skavens—and two more tile sets. Additionally, there are a number of special packs available via in-app purchase. There are character packs, for example, that give you a new character to play along with special weapons, skills, and outfits. 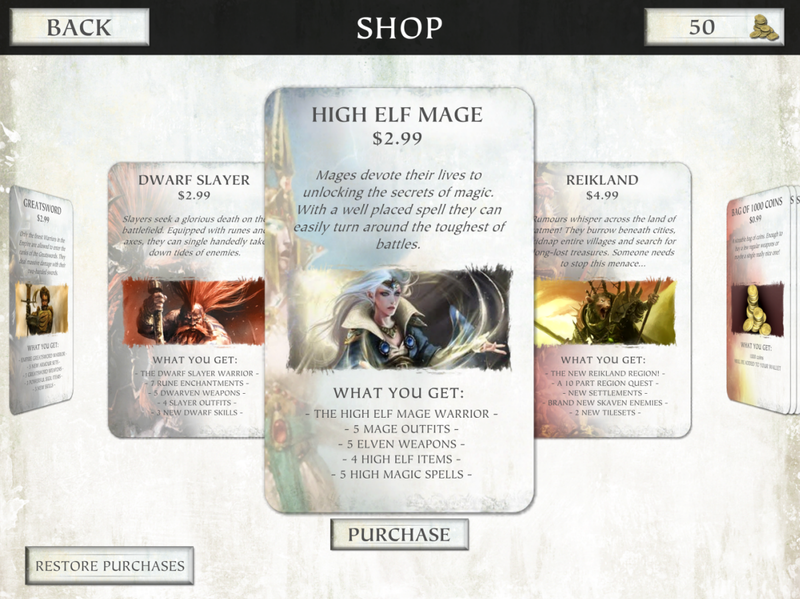 You can also buy gold with which to hire adventurers and buy equipment. You earn gold just by playing the game, so there isn’t a need to pay to advance here, the option is just available for those that want to get their hands on some of the extras earlier. One last thing to note before buying is that upon release there is a bug in the game that causes a crash when trying to load a saved game. I experienced this bug on two different game saves and can’t get back to my main game. Perchang is aware of the bug and there should be an update very soon, but in the interim it is best to either not exit a game back to the main menu or wait until a new version is released (the game was reviewed on version 1.003). Warhammer Quest 2: The End Times is exactly what I wanted to see in this sequel. The game play is fun, challenging, intuitive, and compelling—pretty much the mix of adjectives you want for a video game. Perchang didn’t try to reinvent the wheel here, they stuck with what worked well in the original and updated things where it made sense to do so. Whether you’re a fan of Warhammer Quest, or tactical-combat games in general, picking up The End Times is an easy decision. Do it. If you’re looking for more information on the game you should head to our forums where the page count for Warhammer Quest 2 is growing by the day. Perchang developers have also been active participants in the discussion there and have shared quite a bit about the game.